We want you to be satisfied with our service and products. If you've mistakenly bought a product or the product doesn't meet your expectations, feel free to contact us. 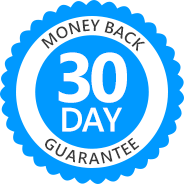 You'll get your money back up to 30 days after your purchase, no questions asked! First, uninstall the program. Then, contact our support via web form or email. This also applies to all our partner products. Our support staff will make sure you get your money back without hassle.